Walpole Park. Photo by HoosierSands via the Londonist Flickr stream. Ealing — long known as the queen of the suburbs and home to the world's oldest continuously working film studio — has seen plenty of change over the past decade or so. And while, at first glance, it may seem that Ealing has little more to offer than every chain restaurant and coffee shop you can think of — a closer look reveals far tastier treasures. For a healthy option, head to FarmW5 for homemade yoghurt and granola with an eye-wateringly healthy, freshly-pressed fruit juice. The produce here is so fresh it wouldn't shock us if you heard a cow mooing out back while queuing up. For a taste of America, head to Limeyard for a stack of warm, fluffy buttermilk pancakes served with crispy maple bacon and doused in syrup. Hook a right out of Ealing Broadway station and less than a minute's walk away you have two great independent spots. Electric Coffee Co serves the best caffeine in Ealing in the kind of industrialised chic surroundings you'd usually expect in central/east London. Open till 11pm on Friday and Saturday they also offer wine through adventurous importers Red Squirrel. A few doors down you'll find one of the capital's best Japanese patisseries, the WA Cafe, which serves beautifully crafted takes on classic French patisserie, incorporating matcha into both cakes and coffee along with deep fried curry filled doughnuts. Read our full review here. Artisan is a small chain with their Ealing store doubling up as a coffee school and Cafe Zee roast their own beans on-site — both these guys are on New Broadway and have strong food offerings making them good alternate breakfast spots. Down in South Ealing, head to Paperback Coffee or if over in Acton, Laveli Bakery. 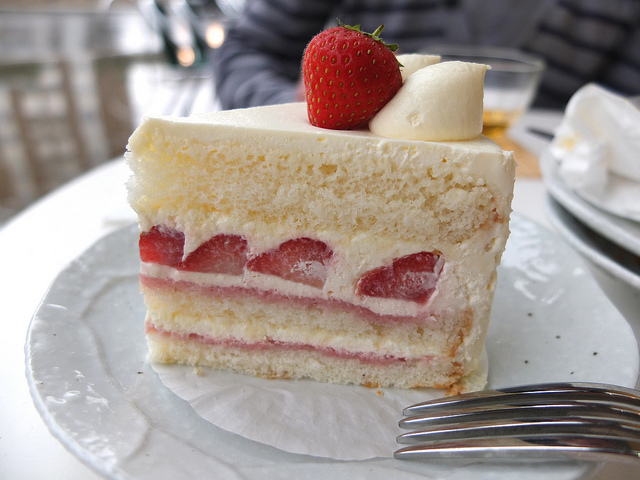 Strawberry shortcake at WA Cafe. Purdy. Photo: Helen Graves. Tuesday to Friday you can enjoy three courses at Pillars — the University of West London's award-winning training restaurant — for £12.45. What it lacks in ambience it makes up for in value. Ealing is home to a large Japanese community and two great Japanese restaurants are handily located opposite Ealing Common tube station. In Atari-Ya Ealing has one of London's most diverse sushi bars. Just down the road, Kiraku is a buzzing little gaff usually filled with local Japanese residents; quality across the board is extremely high and along with great sushi, sashimi, udon and tonkatsu. Bonus fact: you'll also be sitting opposite the UK's first ever Nando's. Blue Ocean on Pitshanger Lane is one of London's best fish and chip shops, open for over 35 years. They also own a fishmonger a few doors down so you know the produce is fresh and it's BYOB (try wine shop Harrisons down the road). Not long after opening in 2010 Santa Maria was voted London's best pizzerias and they've just opened a second branch over in Chelsea. 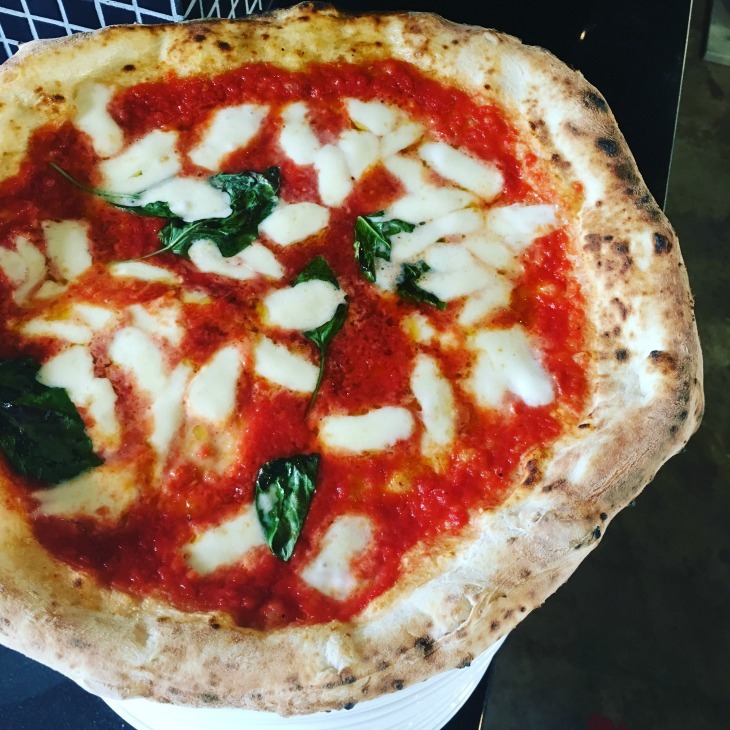 As they don't take bookings lunch is a less pressured, more enjoyable time to sample the excellent Neapolitan style pizza. If it's too rammed you can always grab a pint at the Red Lion next door (it's now been bought by the Santa Maria owners so you can get great pizzas there too) or head down to L'oro di Napoli just off South Ealing Road where there's a bit more space and the pizzas are of a similarly high standard. Franco Manca remains a very popular spot too. Finally, family run cafe Sikulo makes hand made pasta to die for. Set lunches at Kiraku in Ealing. Photo by Su-Lin on Flickr. The Ealing Park Tavern was a brew house as far back as 1728; they have a microbrewery called Long Arm and sell their wares from keg, cask and bottle. The pub also boasts wood panelling, log fires and a decent garden. The Red Lion (next to Santa Maria) has always been the local watering hole for those working at nearby Ealing Studios, filled with black and white photos of past clientele it has a lovely little beer garden out back and offers one of Ealing's best Sunday roasts. In summer, The Drayton Court Hotel is the place for an al fresco pint as it has what must be one of London's largest beer gardens. Pitshanger Lane is bookended by two good pubs; The Village Inn is relatively small but has a strong food offering and the Duke of Kent at the other end has a great beer garden with a 70-strong wine list — one of the best in the area. Other drinking holes worth a look in if you're near are The Wheatsheaf and Haven Arms, a proper locals' boozer not far from Ealing Broadway Station, The Lodge Tavern for cocktails or North Star for decent beer selection. Go for The Castlebar or The Star and Anchor if you're down in West Ealing. Crispin's is an old-school wine bar to the core and has been here longer than we can remember. If you're lucky you can grab the booth by the window and settle in as the place fills up and someone jumps on the piano for a sing-song. For something a little more contemporary head down to Churchfield road in Acton where you will find the small but perfectly formed Vindinista, which offers a great range of wines by the glass, carafe and bottle. The recently renovated Station House pub down the road is also well worth a look-in with decent beers and a food offering that always over delivers. 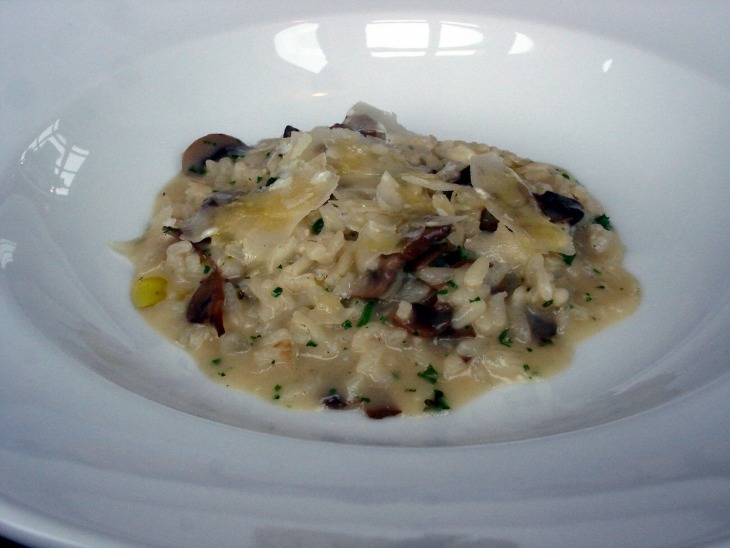 Wild mushroom risotto at Charlotte's Place. Photo: Su-Lin on Flickr. Charlotte's Place on Ealing Common has been at the centre of Ealing's fine dining destinations for 30 years now and for good reason, picking up numerous awards it's the kind of place you'd be happy to take your mum on her birthday. They now have sister restaurants in Chiswick and the latest addition, CharlotteW5 in fancy new development Dickens Yard is one of the best places to eat and drink in Ealing. The drinks list excels in all areas with Ealing's best cocktails and a well-priced, eclectic wine list, with everything available by the carafe. 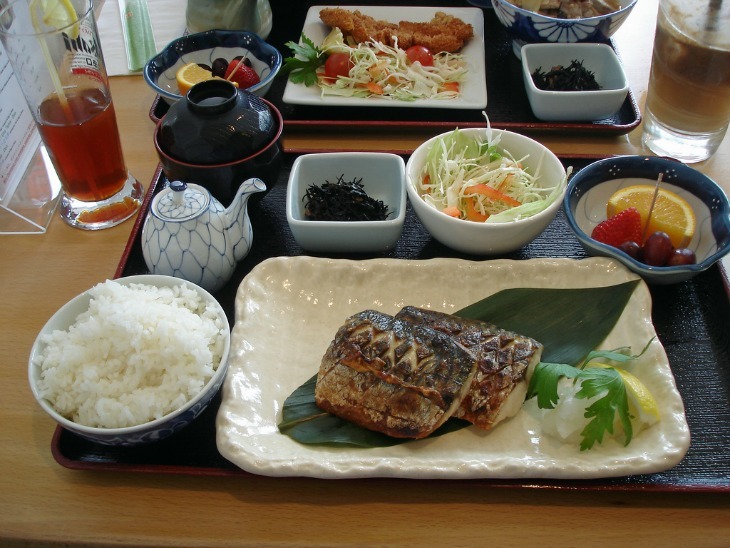 Food is excellent too and comes in three different portion sizes; taster, small and large. Maxim down in Northfields has been open since 1974 and is by far the best place to eat Chinese food in Ealing, rated by Alan Yau as his top Chinese restaurant in London. Try the beef stir-fried with ginger and spring onion. Shikumen on Bond Street is best for dim sum, though it feels more like eating in a boardroom than a restaurant. The food is top notch though, the prawn and bean curd skin cheung fun not to be missed. Eating at Tandoori Villa on Ranelagh Road feels a little like you've wandered into someone's front room but look past this and you'll be treated to fresh, quality Indian food at incredibly reasonable prices. It's also free BYO making this the perfect mid-week meal out. Beautiful pizza at Santa Maria. Photo: Santa Maria. Ealing doesn't excel when it comes to late night party action though many bars do stay open into the early hours. Crispin's mentioned above opens till 1.30am Friday and Saturday and there's a branch of Turtle Bay that's open till gone midnight for Caribbean style cocktails. Acton is really where you want to head to once the pub shuts. The Chatsworth Bar opens till 2.30am Friday and Saturday.